JULIE Goodwin's latest cookbook is clearly a labour of love. Written for her three young adult sons, she has compiled a treasure trove of recipes, information and kitchen wisdom into one incredibly handy guide. Julie describes this book as a "collection of everything I think is important to know in order to be able to nourish yourself and the people you love”, specifically thinking of her three boys when they have families of their own. With more than 300 recipes, this cookbook's categories include: eggs; meat; poultry; seafood; sauces, soups and dips; vegetables and preserves; baking; and desserts, covering all the basics a new cook could need. If you want to know how to make scrambled eggs, pork noodle stir-fry, sticky chicken drumsticks, soft shell crab tacos, cheese-stuffed meatballs, hash browns, roast beetroot dip, flatbread, peanut butter cookies, no-bake lemon cheesecake, caramel sauce or chocolate trifle, it's all here, set out clearly in easy-to-follow recipes. This book would make an ideal gift for family members who are spreading their wings, or for anyone you would love to see eating well. Preheat oven to 160C. Grease and line a 26 x 34cm baking tray with baking paper. In the bowl of an electric mixer, whip the egg whites until soft peaks form. Add the sugar a little bit at a time, whipping continually, until the sugar is dissolved and stiff peaks have formed. Sprinkle over the cornflour, vinegar and vanilla and gently fold through the egg whites until combined. Do this very gently so as not to knock the air out of the mixture. Spread the mixture into the baking dish and bake for 20 minutes or until just firm. When the meringue comes out of the oven, allow to cool for 5 minutes. 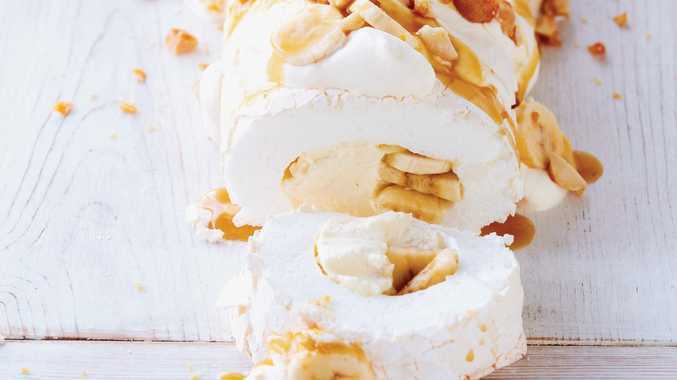 Sprinkle a fresh sheet of baking paper with cornflour and lay over the top of the meringue. Lay a clean tea towel on the bench, and carefully invert the baking dish so that the meringue comes out on top of the baking paper and on top of the tea towel. Carefully remove the baking paper from the bottom of the meringue. Spread half the cream in a line along the long edge of the meringue closest to you. Press half the sliced bananas into the cream. Now the fun part: carefully, using the tea towel as a helping hand, roll the meringue over the cream until it looks like a log. Carefully lift on to the serving plate, putting the join at the bottom. For the caramel sauce, heat a large frypan over medium heat and melt the butter and brown sugar together. Add the cream to the pan and bring to the boil, stirring, for 2 minutes or until slightly thickened. Remove from the heat and allow to cool (at room temperature - don't refrigerate). For the candied macadamias, place the nuts and icing sugar in a frypan over medium-high heat. Stir until the icing sugar melts and turns golden. Stir to coat evenly and tip the mixture on to a tray lined with baking paper. Allow to cool and bash gently with the base of a glass or a rolling pin to crush just a little. Immediately before serving, spread the remaining cream over the roulade. Spread the remaining banana over the top, drizzle generously with caramel sauce and sprinkle with the macadamias. 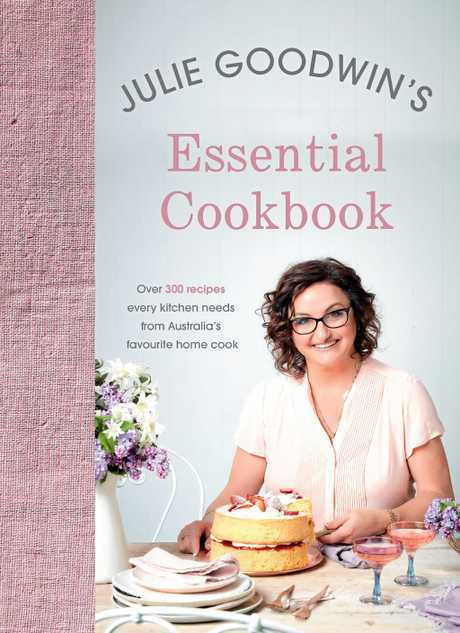 Julie Goodwin's Essential Cookbook ($39.99), published by Hachette Australia.